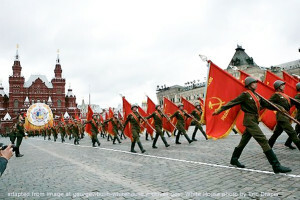 The New York Times covers Russia’s celebration of Victory Day amidst current international tensions. … Putin has recast what he calls the country’s most important holiday to celebrate the might of the Russian state, the days are over when … Western leaders joined Mr. Putin on the bleachers …. The nationalistic fervor surrounding the parade and the tensions over Ukraine mean that the United States and most Western countries will be represented by their ambassadors.